Emperor’s Kitchen Traditional Umeboshi Vinegar is the tart, salty by-product of the pickling of umeboshi plums.The ruby red color comes from red shiso, aka beefsteak leaf, an ingredient used in the pickling process of the plums. Sprinkle it on blanched or steamed vegetables; add to salad dressings, marinades, hot sauce, salsa, and dips. 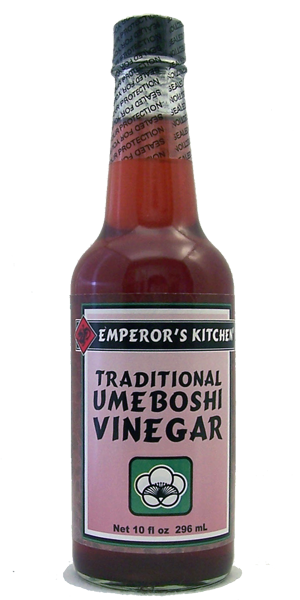 Emperor’s Kitchen Traditional Umeboshi Vinegar is a lively, versatile seasoning that adds a pleasantly pungent flavor to salad dressings, cooked vegetables, sauces, stir fries or greens. It has a refreshing, unique, fruity tartness that is a delicious alternative to your regular vinegar, and its rich taste is a delicious, healthful replacement for butter and salt.